The National Organization for Women have kicked off their “Enough Rush” campaign with a website and online store selling T-shirts, mugs, tote bags, and even mouse pads. Protests were scheduled at various cities Friday, and news reports indicate seven protestors showed up at Limbaugh’s Washington, DC affiliate. Will this end the media’s discussion about Rush Limbaugh’s comments? I’m not sure, all I know is Rep. Nancy Pelosi (D-Calif.) et al. have been quite cheerful the attention is all on Limbaugh, with little attention to the left-wing lunacy regurgitated by Sandra Fluke at the mock hearing. There has been a lot of discussion concerning where the money really is on conservative blogs, the Wall Street Journal and the Rush Limbaugh show. I heard Limbaugh discuss the subject during his first hour yesterday and I thought his presentation was a bit confusing to listeners. Flashback: 2004, Matthews wanted Bush to fail? That was then, this is now. From Hardball the day after the re-election of George W Bush term 2. Just to refresh your memory, Kerry was supposed to win, beginning the big progressive comeback. It didn’t happen and so the left began their “frog march” to frog march the President out of the White House in cuffs. https://radioviceonline.com/wp-content/uploads/2011/02/rvo-logo-4-300x100.jpg 0 0 Jim Vicevich https://radioviceonline.com/wp-content/uploads/2011/02/rvo-logo-4-300x100.jpg Jim Vicevich2010-02-17 08:15:352010-02-18 07:07:58Flashback: 2004, Matthews wanted Bush to fail? This is probably the last Rush post for a while …. but more and more I see conservatives on these talk shows pushing back … with fact … and I like it. Thursday night Chris Matthews had Al Sharpton on with Pat Buchanan to discuss Rush and the NFL and the fact that Rush had been dropped over the controversy. Sharpton, citing the only two controversial racial statements they had for (Rush on McNabb and on the NFL “Crips and Bloods”) says he would drop Rush too given his divisive nature … and Pat goes crazy. And as an added bonus they both through in Don Imus. Ha! ESPN says Rush is out – Gateway Pundit details smears – Update: damages? It really is outrageous. Right from the first charge we posted Monday. The formula is familiar … spread lies … here … and here … and my favorite, here. Then put pressure on the NFL management to act, responsibly, or face the same fate ….. raaaaaaaacist. The end result … Rush is being forced out. Rush Limbaugh is expected to be dropped from a group bidding to buy the St. Louis Rams, according to three NFL sources. Dave Checketts, chairman of the NHL’s St. Louis Blues and the point man in the Limbaugh group attempting to buy the Rams, realizes he must remove the controversial conservative radio host from his potential role as a minority member in the group in order to get approval from other NFL owners, the sources said. Three-quarters of the league’s 32 owners would have to approve any sale to Limbaugh and his group. Earlier this week, Indianapolis Colts owner Jim Irsay predicted that Limbaugh’s potential bid would be met by significant opposition. Several players have also voiced their displeasure with Limbaugh’s potential ownership position, and NFL Players Association head DeMaurice Smith, who is black, urged players to speak out against Limbaugh’s bid. Ultimately, the sources said, Checketts must reconfigure his group and find another investor to make his bid more viable. Perfect. And if you are a conservative too … just to remind you of what they think of you ….. raaaaaaaacist! Added by Steve: I’m wondering about damages. If CNN – and many other media outlets – posted this quote up, which at this point seems to be flat our slander, and as a result, Limbaugh was dropped from consideration, what kind of damages could we be talking here? As I note in the comments section below, it seems to be open season on conservatives and it’s making me sick. Gault. Looking. Good. https://radioviceonline.com/wp-content/uploads/2011/02/rvo-logo-4-300x100.jpg 0 0 Jim Vicevich https://radioviceonline.com/wp-content/uploads/2011/02/rvo-logo-4-300x100.jpg Jim Vicevich2009-10-14 18:18:492009-10-14 20:59:54ESPN says Rush is out - Gateway Pundit details smears - Update: damages? Matthews: Conservatives watch football don’t they? Come on … he’s joking right? 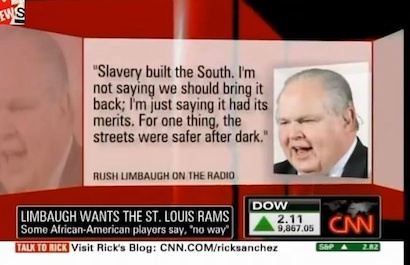 Chris Matthews debating whether Rush Limbaugh should be allowed to purchase the St Louis Rams, complete with past Rush quotes that even Matthews points out were not racist. But the conversation veers way off course right after sports commentator Kevin Blackistone says the NFL is doing very well without Limbaugh (well not the Rams), and doesn’t need Limbaugh. Matthews follow up question is … ummm … Matthews. But talk show host Stephen Smith’s answer is priceless, followed by a tirade about black players standing up for issues or something. Yes, Stephen, conservatives watch football. What goes unsaid here is the reason the question is asked. These libs are actually convinced conservatives are a racist enclave that won’t watch sports because there are black players. And just what are these issues that black players are supposed to be standing up for? Just win baby …and that’s all Rush wants to do too. https://radioviceonline.com/wp-content/uploads/2011/02/rvo-logo-4-300x100.jpg 0 0 Jim Vicevich https://radioviceonline.com/wp-content/uploads/2011/02/rvo-logo-4-300x100.jpg Jim Vicevich2009-10-13 08:56:572009-10-15 10:37:56Matthews: Conservatives watch football don't they?